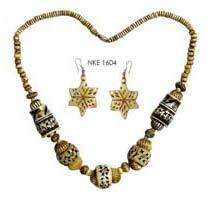 We are offering intricately designed Fashion Necklace Set that well-compliment every attire. Our Fashion Necklace Set includes one neckpiece and two matching earrings. Fashion Necklace Set that we offer is crafted using excellent quality materials and is extremely light in weight as well as skin-friendly.